This update specifically summarizes the potential of oscillating field stimulation (OFS) to minimize neurological damage after acute SCI. OFS was the focus of an article published in the Journal of Neurosurgery Spine (January 2005) by Dr. Scott Shapiro and colleagues at Purdue University (West Lafayette, IN). OFS therapy is based upon observations that appropriate electrical cues guide and promote neuronal growth. For example, studies suggest that in early development, naturally occurring voltage gradients channel nascent neurons down the neural tube, the spinal cord’s anatomical precursor. In addition, studies indicate that 1) regenerating axons are attracted to an electric field cathode (i.e., negative pole of applied field) and 2) such a field may alter neuron-supporting glial cell density and organization within the injury scar in a fashion that is less inhibitory to regeneration. Because implanting the cathode above or below the injury site will promote neuronal growth only in one direction, the OFS device alternates polarity every 15 minutes. With such a device, regeneration in both ascending and descending neurons is stimulated. OFS therapy is only beneficial for acute injury. If device implantation is delayed several months, regenerative benefits will not accrue. OFS therapy is based on extensive research by Shapiro’s colleague, Dr. Richard Borgens, using dogs with naturally occurring SCI, often due to explosive disk herniation that rapidly progresses into complete SCI. Borgen’s research includes two randomized, controlled trials in dogs (Borgens et al. J Restorative Neurol Neurosci 5, 1993 and Borgens et al. J Neurotrauma 16, 1999), which laid the foundation for the recent human trial discussed below. In Dr. Borgen’s 1999 dog study, OSF devices were implanted in 20 paraplegic dogs and compared to 14 dogs with an implanted sham device. After six months, overall improvement, measured by a variety of neurological assessments, was greater in OFS-treated dogs. Given these results, the Food and Drug Administration (FDA) approved a Phase-1 clinical trial to assess safety in ten patients with complete injuries ranging from the C5 to T10. The patients’ age ranged from 18 to 43 (median age 23) and all but one were males. Six injuries were due to motor vehicle accidents, two from falls, one from diving, and one from violence. 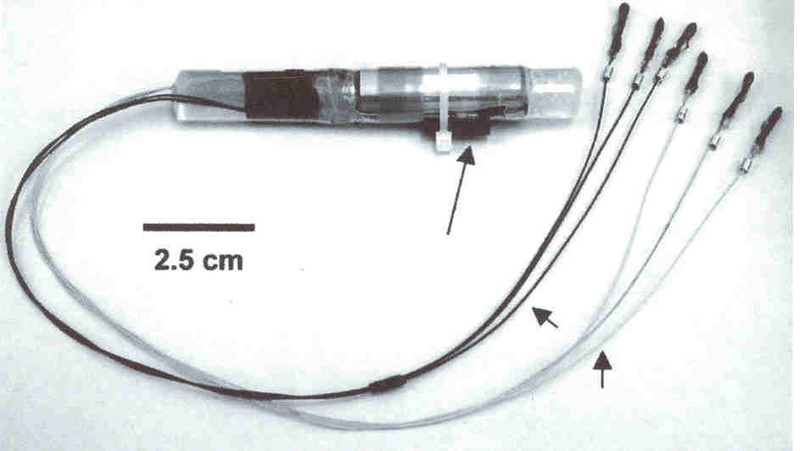 Within 18 days of injury, the cylindrical OFS device (11-centimeter long; 1-cm diameter) was implanted in the patients’ paraspinous musculature below the injury site to minimize pain or discomfort. Emanating from the device are two sets of three electrodes. The electrodes in one set are sutured to the spine’s spinous process and right and left facet joints one segment above the injury site, and the other leads are connected to the same points a segment below the injury site. Simply stated, for a C6 injury, the electrodes would be connected to the spine at the C5 and C7 level. The OFS device was removed at 15 weeks. Results indicated that the procedure was safe, the goal of this Phase-1 trial. A variety of functional assessments was carried out at six months and one year after implantation. All subjects demonstrated improved sensation, and some regained significant motor or sexual function. However, because no controls were included in this study designed to assess safety, overall efficacy could not be directly evaluated as in the case of the aforementioned dog studies. Although improvements were observed for most subjects a year after implantation, some recovery is routinely noted during this post-injury period. As such, because the study had no built-in reference point, results were compared to patient improvements documented in the third NASCIS (National Acute Spinal Cord Injury Study) trial. This comparison strongly suggests that OFS therapy exerts beneficial effects after acute injury in humans. FDA has improved additional testing in patients with acute SCI, and Purdue University has licensed the technology to Andara Life Sciences, Inc. Adapted from article appearing in October 2005 Paraplegia News (For subscriptions, call 602-224-0500) or go to www.pn-magazine.com).